Last week, I was at the London Language Show demonstrating simple techniques to help interpreters and translators beat stress, whether acute or chronic. The room was packed, and too small to get the audience lying on the floor for some deep relaxation. Instead I had them all close their eyes and do a series of stretching exercises, some deep breathing, and a quick autogenic training sequence. It was super-fun watching everybody tilting their heads to one side, clasping their hands, and breathing in and out in sync. A bit like synchronised swimming (but without the pool). As it happens, I’m actually a very cerebral person. I’m a big one for lists, action plans, and self-analysis. But I’m also very fortunate in that the mind/body connection has always played a big part in my life. 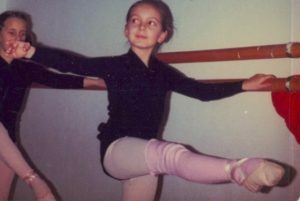 I did ballet for 11 years, followed by competitive ballroom dancing, and then I trained as an aerobics instructor and personal fitness trainer. All of this left me with decent posture, good core strength, and a deep appreciation of the benefits of exercise, not just on physical health, but also on mental processes, from concentration and alertness to emotional regulation and stress management. Looking demure in the 80s. Feistier in the 90s. Now you know why I like Strictly Come Dancing. I also have no doubts whatsoever that, conversely, the mind can influence the body in very powerful ways, both negative and positive; in my case, the negative was developing a 12 year driving phobia after a minor accident when driving my boyfriend’s car. And the (very) positive was giving birth to my two children at home, with no drugs or medical intervention, using visualisation techniques and deep relaxation (and a pool – there’s definitely a theme there…). Today, I’d like to share with you a few simple yet powerful techniques that can help you beat stress and achieve better focus and concentration, using the mind/body connection. Brain Gym is a movement-based programme, composed of 26 movements. Its goal is to support the physical skills required for learning. For instance, the ability of the eyes to horizontally track a line without moving the head, or the ability of the hands to write without contracting the shoulders or the back, or the ability to sit squarely on a chair allowing for a better grounding and concentration. Those of you who know me, or have attended any of my seminars, will know that I have a scientific background and I like to back my advice with research. Brain Gym isn’t well substantiated by research. In this respect, it resembles many complementary therapies for which there is plenty of anecdotal evidence (e.g. aromatherapy), but not much scientific evidence, because it is difficult to conduct double blind studies. My feeling is that if these techniques work for you, it doesn’t necessarily matter why they work. They may be effective on some people and not others; or we may not yet understand the mechanisms behind them, because the mind/body connection is so complex. I’m sharing them with you because they don’t carry any risk, and they may do a lot of good. Also, they’re very quick – and I know you all lead busy lives! I think it’s worth listening to the experience of practitioners, and that is why I have asked my colleague Maria Karakostanoglou to talk you through these three techniques. 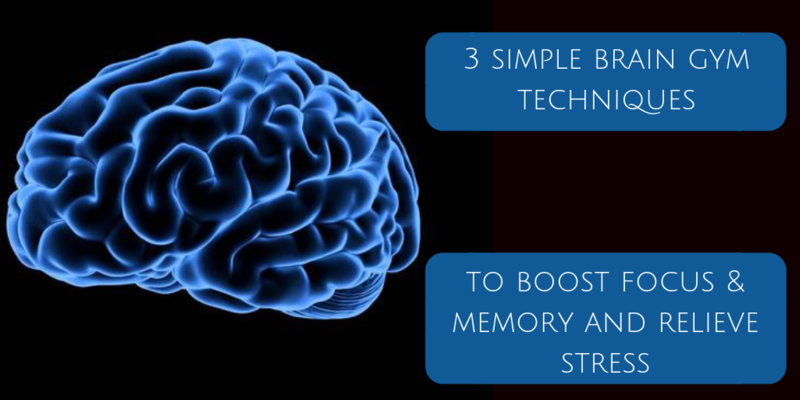 If you would like to learn more about the applications and benefits of Brain Gym, read on. Or if you would rather, you can skip to the three simple exercises you can try today. I asked Maria what first drew her to Educational and Kinesiology and Brain Gym. Maria: “It was during a very hectic time in my life, when I would work as a free lance interpreter for the European Commission three days a week and would study kinesiology for four days. That had been going on for more than 10 months, no breaks, no days off. It was in the middle of February I remember, on a Sunday evening that I had just walked back home, under pouring rain, tired, having just finished the basic Brain Gym 101 4 days training. I just wanted to get under a hot shower and into my bed. But I had a fisheries meeting at the Council the following day and I had to prepare and frankly I felt I had no energy to do that and mostly not a mind to do it. 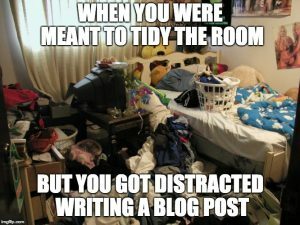 My apartment felt like a not very creative chaos, I did not know where to start with tidying up and I felt my mind could not function unless I could put some order around me. I thought “I just did this Brain Gym thing, let’s see if it really works”! I think I was desperate enough to try just about anything at that point. So I did what is known as an “Action Balance” with the goal “I effortlessly and effectively tidy up my apartment”. 20 min later it was as if a curtain had been lifted from my eyes, I even now, remember the pair of socks I picked up to start tidying up. I was fired up! 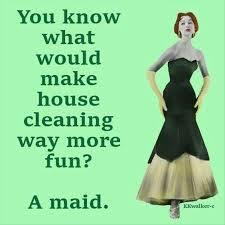 One hour later my apartment was tidy and clean, dishes washed, clothes put away. I had so much more energy than when I had walked through my door and my mind felt so much clearer. I was really ready to sit down and prepare for my meeting and I actually did just that! It was at that moment that I decided I really want to learn this Brain Gym well enough to be able to teach it to others. I felt that the quality of my life had taken a turn for the best that day. I could do something to get me moving to a very clear direction, I had a tool that allowed me to take the responsibility to move where I wanted to go. Sophie: It sounds as though Brain Gym has had a powerful effect on your life. But what effects do your clients report? Within a week people report greater ease in concentration, greater willingness to stay with something that they don’t particularly enjoy and over time a shift from an attitude of “I cannot/will not do it” to “I am willing to give it a shot”. Sophie: All of this sounds pretty good to me. Greater energy and focus, a better memory, and less stress, are exactly what most of us are looking for! So let’s have a look at those exercises I promised you. Put a piece of paper centrally in front of you (in line with your belly button). 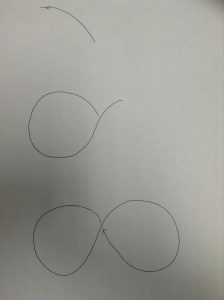 Draw a large lying down 8 (also known as an infinity sign) in the middle of your sheet of paper. 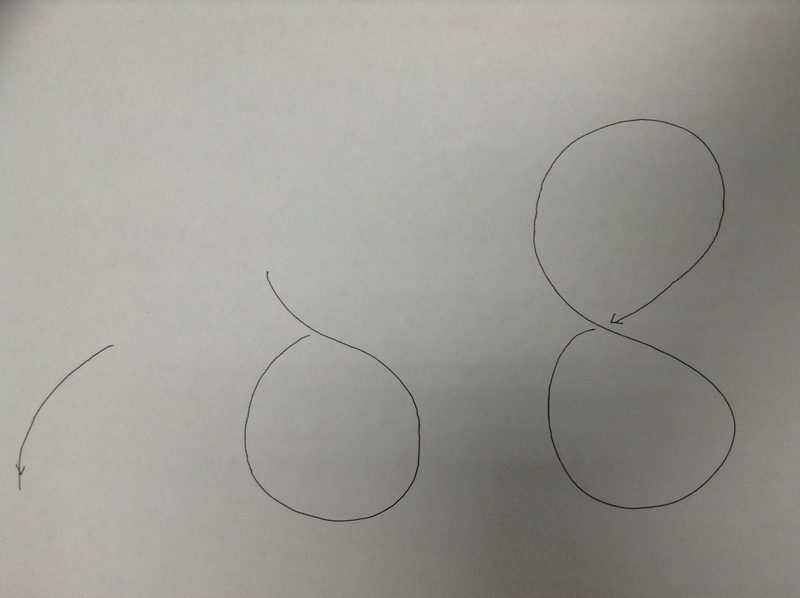 Move the pen counterclockwise; go centre, up left, over and down, come back to the middle, and then draw the right side of the 8. Do this 3 times, then switch hands and draw another 3 lazy 8s. Then clasp your hands together and draw over the lines another 3 times. Here’s a quick illustration of the direction of drawing. Don’t copy the arrows! They’re just to show you which way to go first. Benefits: This exercise is said to help you tune out distracting noises and increase listening ability, as well as improving short-term memory and abstract thinking skills. It’s therefore ideal to do just before an interpreting exercise, especially in simultaneous. With one hand at the top of each ear, gently ‘unroll’ the curved parts of the outer edges of both ears at the same time, with your thumb on the inside of the ear. Continue all the way to your earlobes. Repeat three or more times. Benefits: This exercise brings balance and flexibility to your spine, and reverses the way we usually sit (hunched forward). 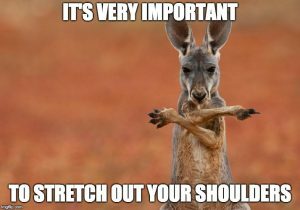 It therefore releases tension from the neck and shoulders, improves posture, and allows you to focus better on your tasks. Very useful for those who work at desks and computers! Sit on a chair in front of a table, feet hip width apart and flat on the floor. Place your hands on the desk, in front of your shoulders, fingers pointed inwards slightly. Rest your forehead down between your hands. Inhale, press down gently on your hands and forearms, and lift your head, then your sternum, and finally your middle back.Shoulders and torso should stay relaxed, and your chest stays open. As you exhale, tuck your chin down onto your chest and begin moving your head down toward the table, while lengthening the back of your neck. Rest your head on the table as you relax and breathe deeply. Repeat three or more times. That’s it! The reason I’ve chosen these three techniques to share with you today is that they are all quick and easy to do. You can use them before embarking on a complex piece of work, before going into the booth to interpret, and between speakers when you’re feeling stressed. Try them out, and let me know how you get on! Looking for more simple mind/body techniques? Where Brain Gym may be able to boost your focus, concentration, listening skills, hearing, and more, other techniques can help you deal with the pressure of interpreting assignments or translation deadlines. Want to find out more about Brain Gym, and discover other simple techniques that work on the body to quiet the mind (instead of asking you to manage your stress in order to avoid physical symptoms such as raised heart rate, sweaty palms, and feelings of panic)? Join Maria and me in next week’s webinar, entitled ‘Quick mind/body techniques to boost focus and reduce stress.’ We’ll be demonstrating quick, practical, simple movements and techniques to bring about a reduction in feelings of stress and increased concentration and focus. Everything we’ll be showing you is quick and easy to learn. We’ll follow our demonstration with a Q&A session. The webinar, costing €40, takes place on Friday, 30th November at 10 am and 5 pm London time. A replay will be available if you can’t attend at those times. Hope to see you there! 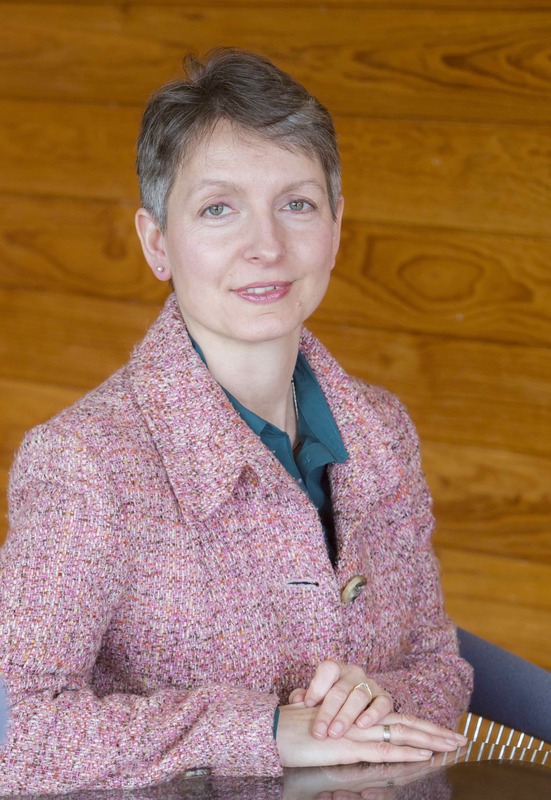 Sophie Llewellyn Smith, writing as The Interpreting Coach, is a coach, interpreter trainer, conference interpreter, designer of online teaching materials, and creator of Speechpool. Follow the blog to pick up tips on how to improve your interpreting skills, and check out the website for digital material to complement your face-to-face learning and empower you to take control of your learning. If you’re interested in personal coaching, why not book a free discovery call? Maria trained as a conference interpreter on the European Commission’s in-house training scheme at the same time as me, and spent ten years working both as a staff and a freelance interpreter. She encountered kinesiology and Brain Gym as a client almost 20 years ago and was impressed enough by how it helped her face her own challenges that she decided to change careers and become a professional kinesiologist. Maria also recently completed a giving back project where she taught Brain Gym tools free of charge to hundreds of primary school teachers in Peru, Chile and Greece, to support children and teachers alike in being more focused and organised and having more confidence in their ability to learn, be it inside or outside the classroom. Here in Europe, the summer holidays are drawing to a close. How are you feeling? Do you find the rentrée, as it’s known in French, exciting or overwhelming? In some ways, I quite like that ‘going back to school’ feeling; as a creature of habit, I enjoy getting back into a routine, and getting stuck into new projects. I also like the excitement of a new academic year at University, with new students full of optimism. eating as if I were still on holiday, with lots of delicious salads. 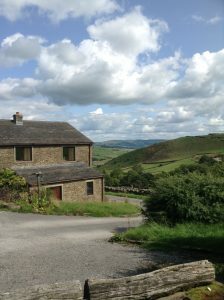 getting up later than usual – I’ll put off my normal 5.45 wake-up call for as long as possible! reading a lot (admittedly, this is sometimes a way of procrastinating, instead of facing up to boring chores). However, with the best will in the world, I can’t entirely ignore my massive to-do list, which makes September look like an exercise in squaring the circle. I often wish the day had 27 hours or so, so I could have a fighting chance of getting everything done. 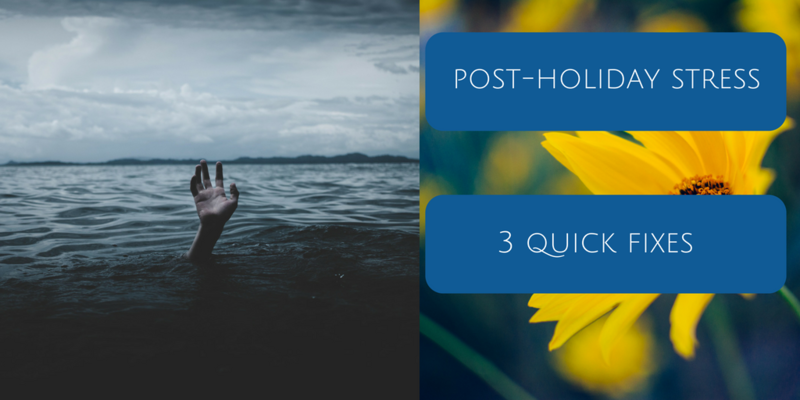 Here are my top 3 tips for dispelling that horrible feeling of drowning in all the things you have to do. I find lists invaluable for keeping track of all my tasks. But sometimes they outgrow the sheet of paper I’m writing them on, and they look so long. 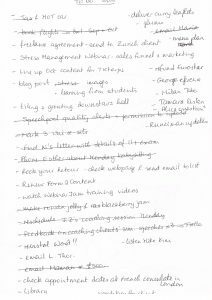 Here’s a simple way to use to-do lists more efficiently. 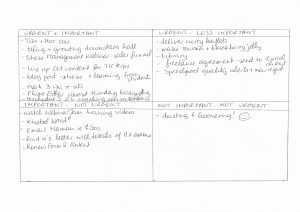 Divide your sheet into 4 boxes: urgent + important, urgent + less important, not urgent but important, not urgent + not very important. Fill in the boxes with all the things you need to get done. Now you can see at a glance the ones you actually need to do right away: they are in the urgent + important box. After that, you can move on to urgent but not important, then to not urgent but important, and finally to not urgent + not very important. Hopefully, if you try this method, you will see that not everything needs doing today. You can plan the order in which to tackle your tasks, and they feel less overwhelming. And perhaps you (or I) will feel less like this. Another advantage of this method, as I see it, is that unless I have guests coming to stay, it almost invariably relegates housework to the bottom of the list. A good way to escape that crushing sense that you have more tasks to do than will fit into 24 hours is to get outdoors, even for a few minutes. Breathe some fresh air and practise mindfulness, which means nothing more than being in the present and using your senses: listen to what’s around you (can you hear birdsong? ), look around and find something beautiful to appreciate. 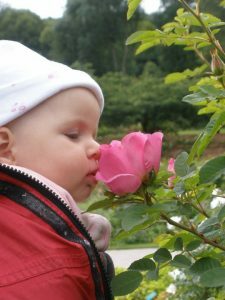 If you can see plants around you, go and rub a leaf or smell a flower: how does it feel? Does it smell good? Lucky me, this is the view from my patio. Instant stress relief! If, like me, you spend a lot of time studying, reading, researching, using computers, and being indoors, you can end up spending 99% of time in your head, and almost forgetting that you have a body. Ground yourself and use all your senses to remind yourself that you are made up of body, mind and spirit. Exercise is very good for this as well. Take five minutes to reset your mindset. When I was talking to my husband about how he manages his (extremely stressful) job, he suggested reminding yourself that you can only do your best, so there’s no point fretting if you can’t be perfect. The problem I see with this is that perfectionist types tend to think that ‘doing their best’ means ‘doing everything perfectly’ and aren’t always able to accept what they view as lowering their standards. Imagine that what you are going through is being described by a friend: the pressure he/she is under, all the stuff he/she needs to do in a ridiculously short time, his/her feelings of inadequacy, etc. What advice would you give your friend? We are generally far more understanding, sympathetic and helpful to other people than we are to ourselves. If you can take a step back and pretend someone important to you is faced with this situation, you are likely to give them (i.e. yourself!) more realistic and objective advice. Ask yourself: what’s the worse that could happen? What’s the worst case scenario if you don’t complete your to-do list? Your life won’t apart. Likely, there are only two or three items on there that could have serious consequences on your life or career: do those first, and ignore the rest for now, if you don’t have time for them (or if getting enough sleep/food/exercise/fun is more important to your physical and mental wellbeing). I hope this has given you some ideas for quick fixes when you’re feeling overwhelmed and you’ve got post-holiday blues. Perhaps your stress is on a different scale altogether: you’ve got a huge work assignment or interpreting exams coming up, or you’re finding your interpreting course very demanding. 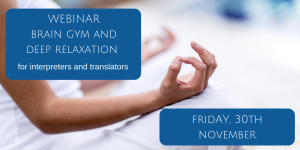 If you’re after more tips and some hard-core stress management advice, I will be holding a 60 minute webinar entitled ‘Stress Management for Interpreters on Thursday, 6th September, followed by a Q&A (cost: €40). I know all about work stress from my own experience as a conference interpreter, but I also have a background in fitness training and complementary therapies, so I like to bring that insight about wellbeing and relaxation into the webinar (I’ll spare you a photo of me in a Lycra leotard, though). or on the home page of www.theinterpretingcoach.com (just scroll down to find the webinar details). In the meantime, why not leave a comment below. Did my tips help? What do you do to reduce that feeling of overwhelm? An experienced conference interpreter and trainer, Sophie Llewellyn Smith helps talented, motivated individuals boost their skills and excel in a competitive market.